Rice water just might be Asia’s best kept beauty secret. It is rich in beauty minerals and vitamins that make it fantastic for both skin and hair – a recipe those flawless-skinned Japanese geishas have known for centuries. Furthermore, female rice farmers in China, Japan, and other Southeast Asian countries used to bathe and wash in the water used for cleaning rice. The Yao ethnic women from the village of Huangluo, China are a testament to this tradition. With their average hair length of about 6 feet, these women made it to the Guinness Book of Records as the “world’s longest hair village”. Amazingly, these women do not have grey hair till their late 80s. The Yao women believe that the fermented rice water, which they use to cleanse their hair, is what helps to keeps their hair long, dark and clean. More energy, healthier skin and shiny hair are just some of the benefits that you will gain from this old Asian recipe that is becoming increasingly popular in the West. All you need are just two cheap ingredients: water and rice. 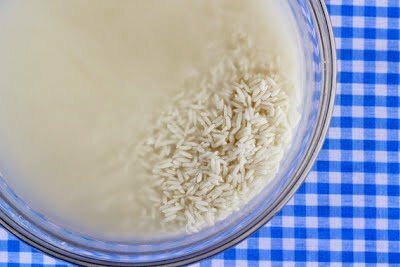 Rice water has amazing hair and skin benefits. A recent research showed that rice water exhibits hair care properties, such as decreasing surface friction and improving hair elasticity. Rice water has inositol, a carbohydrate that can repair damaged hair, as well as protect it from further damage. Specialized imaging technique shows that inositol stays inside the hair even after rinsing, offering continuing hair protection and beautifying effects. Rinsing or washing your hair with rice water will improve manageability and protect it from future damage. In addition, the amino acids in rice water strengthen the hair roots, add volume and sheen and even make the hair silky smooth. These remarkable benefits explain the 6 feet, healthy, long and beautiful hair of the Yao women. Not limited to hair, rice water also has many skin benefits. Due to its cooling and soothing effects on skin, it is often prescribed as an effective ointment to cool off inflamed skin. Rice water also has moisturizing, antioxidant, and healing properties that help to improve circulation, prevent or fade age related spots, and ease inflammation to give you a healthy, better moisturized and clear skin. As long as it’s left on the skin, rice water is even believed to offer mild protection from the sun. It might seem logical that the water in which you wash the rice is rice-water, but that is not the case. You can use that water, but you will not get the same health benefits as if you were using the original rice water recipe, not to mention all the pesticide if your aren’t using organically grown rice. The rice water we want is actually obtained by boiling rice in it. The easiest method of preparing rice-water is to simply add more water when cooking rice for lunch. This water, in which rice has released some of its helpful properties, is the one you need. You can drink it while it is hot or you can leave it to cool down and use it to wash your face or hair with it. Flawless face: Wash your face, then soak a cotton pad in the rice water and apply it all over, as you would do with a toner. Rice is rich in a complex of B vitamins (the previously mentioned inositol) that helps promote cell growth, slows down the aging process and stimulates blood flow – the perfect recipe to tighten pores and bring a glow to the face. Add the moisturizing, antioxidant and UV-absorbing properties, along with an ability to bind to naturally occurring copper in the skin (thereby preventing the formation of melanin – hyper-pigmentation) and age spots, and you can see how rice water is prefer for your face. Haute hair: After shampooing, work in some rice water into your hair. Leave it on for a few minutes, then rinse well. The rice proteins will strengthen your hair shaft and fill in the cracks. The result? Ultra-smooth, seriously shiny hair, even at 6 feet. Beauteous body: The soothing nature of rice water makes it an effective remedy for rashes and other irritating or painful skin conditions. In a dermatological study at Brussels University, patients with chronic inflammation of the skin saw a 20% improvement after taking 15-minute baths filled with rice water twice a day. Recipe for health: Drinking rice water is also extremely beneficial for overall health. It contains 8 essential amino acids, which form the building blocks for tissue and muscle regeneration. Rice water also provides energy due to high concentration of carbohydrates.